A representative from Central Solutions is going to be at Dahlwinnie's tomorrow from 7:30 a.m.-9:00 a.m. and 11:00 a.m.-1:00 p.m. for people to sign up for Wireless Broadband. If you're not here or decide later, their email address is: info@centralsolutions.biz . There is a new subscription link on the main page of the Beaver Island News on the 'Net page. This can be used for a new subscription or for a renewal subscription. This link will allow individual subscription or business subscription payments. Please allow up to one week for the account to be activated or updated. Reported last night via phone, Stanley Brussee previously residing in Venice, Florida, has died. An obituary will follow, if available.
. TOWNSHIP PROPOSAL RENEWAL This proposal will permit the Township to restore the Township's .25 mills for the Beaver Island Historical Society previously approved by the electors and now expired. The Headlee Amendment previously reduced this millage to .2258 mills. This ballot proposal reviews the existing .2258 mills and restores the .0242 mills previously rolled back by the Headlee Amendment. Shall the limitation on the amount of taxes which may be imposed on taxable property in the township of St. James, County of Charlevoix, State of Michigan be increased by up to twenty-five cents ($.25) per thousand ($1,000) (.25 mills) of the taxable value on all taxable property in the township for five (5) years, 2007-2011 inclusive, for the purpose of providing funds for the operation of the Beaver Island Historical Society? If approved and levied in itsentirety, it is estimated that the .25 mills would raise on estimated $10,535 for the township when first levied in 2007. Reminder: the Citizen of the Year banquet is next Saturday the 28th at Nina's. If you want to attend a reservation may be essential as we expect a sell out. Please make plans to attend by calling Nina's at (231) 448-2396. A great meal, including appetizer and desert is only $19.95. Please don't delay. We are pleased to report that membership is at a record high of 114 with an additional 24 business listings. Our total Beaver Island marketing expenditures total a little over $20,000 a year. Thanks for your support! One day an Irishman, who had been stranded on a deserted island for more than 10 years, saw a speck on the horizon. He thought to himself, It's certainly not a ship." And, as the speck got closer and closer, he began to rule out the possibilities of a small boat and even a raft. Suddenly there emerged from the surf a wet-suited black clad figure. Putting aside the scuba gear and the top of the wet suit, there stood a drop-dead gorgeous blonde! The glamorous blonde strode up to the stunned Irishman and said to him, "Tell me, how long has it been since you've had a good cigar?" With that, she reached over and unzipped a waterproof pocket on the left sleeve of her wet suit and pulled out a fresh package of cigars. He takes one, lights it, and takes a long drag. "Faith and b'gorrah,"said the man, "that is so good I'd almost forgotten how great a smoke can be!" "And how long has it been since you've had a drop of good Powers Irish Whiskey?" asked the blonde. Hearing that, the blonde reaches over to her right sleeve, unzips a pocket there and removes a flask and hands it to him. He opened the flask and took a long drink. "'Tis nectar of the Gods!" stated the Irishman. "'Tis truly fantastic!!!" With tears in his eyes, the Irishman fell to his knees and sobbed, "Jesus, Mary and Joseph! Don't tell me that you've got golf clubs in there, too!" How the location change came about is only Jim's business, but the wonderful pizza that he produces will still be available on the Island. Jim's pizza has delighted the entire Island on Monday nights all fall and winter at Stoney Acre Grill. Many have appreciated his work and have kept the Stoney's convection oven quite busy. Beginning Monday, April 23, 2007, Jim's famous pizza will be available at the Beachcomber Restarant and Bar from 5-8 p.m. He will continue making pizza after 8 p.m. based upon the order volume that comes in. If this is successful as it has previously been, it may continue into the summer season as well. The Beachcomber Restaurant and Bar is having a Kentucky Derby Party on May 5, 2007 beginning at 4 p.m. and continuing until ? 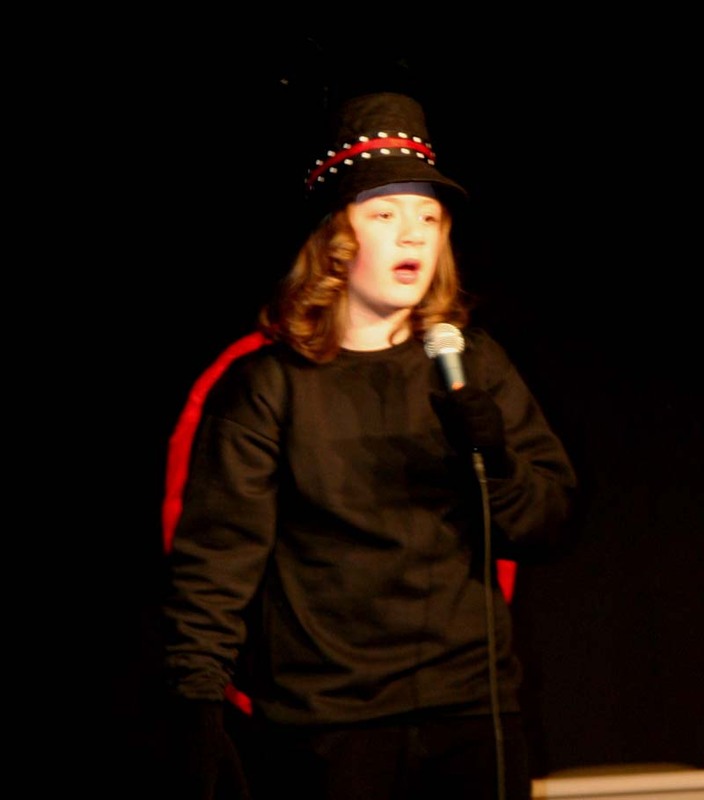 There will be prizes for the best hat, and attendees are are asked to dress up if they want. At this time, the name of the group performing the live music is unknown. The Dog House Boodlers may perform if they don't have another playing engagement in Charlevoix or other mainland location. If they do, the older Boodlers may take their place. Whoever performs will make this another great party like the Beach Party held earlier this month! 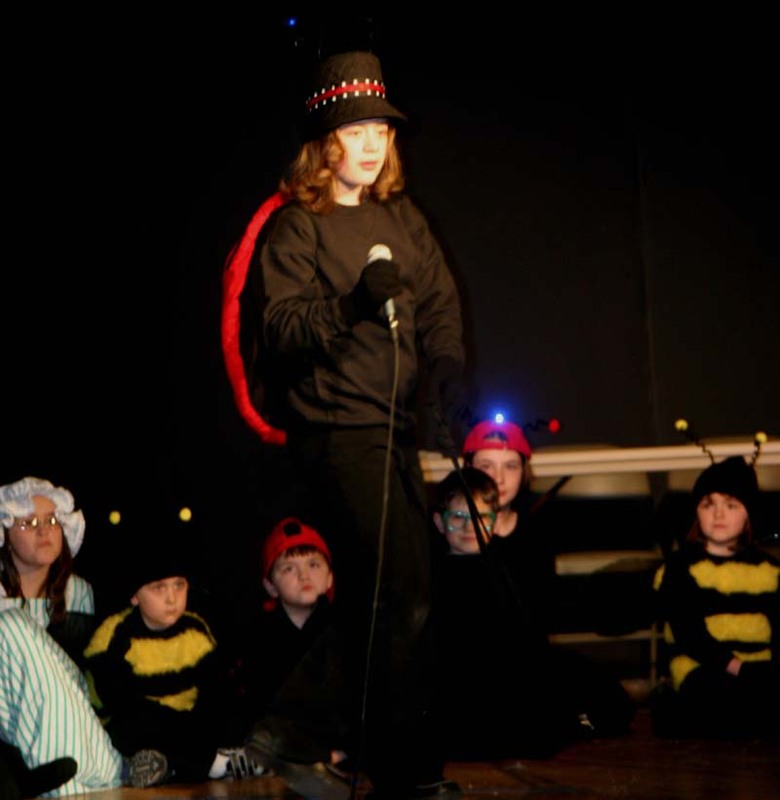 The yearly Donna Stambaugh production with the 5th and 6th grade students of the Beaver Island Community School will take place on Friday, May 4, 2007, at 7 p.m. In this "Doc, Doc, Goose" production the plot is there have been so many accidnts in nursery rhymes that Mother Goose has gotten a medical degree and opened up a clinic in Nursery Land. The admission to this production is $3 and benefits the Fifth and Sixth Grade Class Trip to Camp Hayo-Went-Ha. (This trip is scheduled for May 15-18.) There will be raffles and a concession stand by the Girl Scouts and/or Brownies. If you would like to donate an item or gift certificate to the raffle, please contact the school. 448-2744 or any member of the 5th/6th grade class, Donna Stambaugh or Debbie Robert. Raffle tickets will be sold at the door. $1.00 ea or 6/$5.00. This production is notoriously funny with wonderfully talented youngsters from our community. There will also be a cameo performance by a 'secret' guest. Please come out and support these young people. 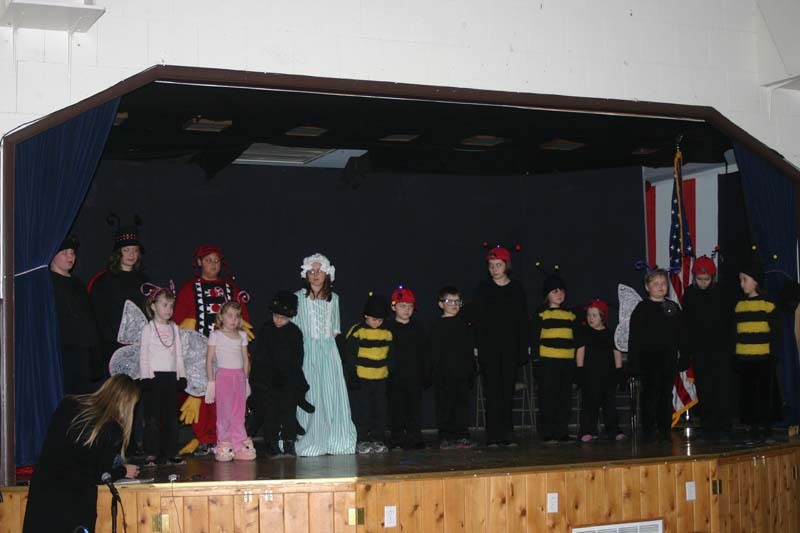 The Beaver Island Community School's elementary musical was held on April 17th, 2007, starting at 7 p.m. and had a cast including preschool students up through 7th grade. Miranda Rooy was the musical director. 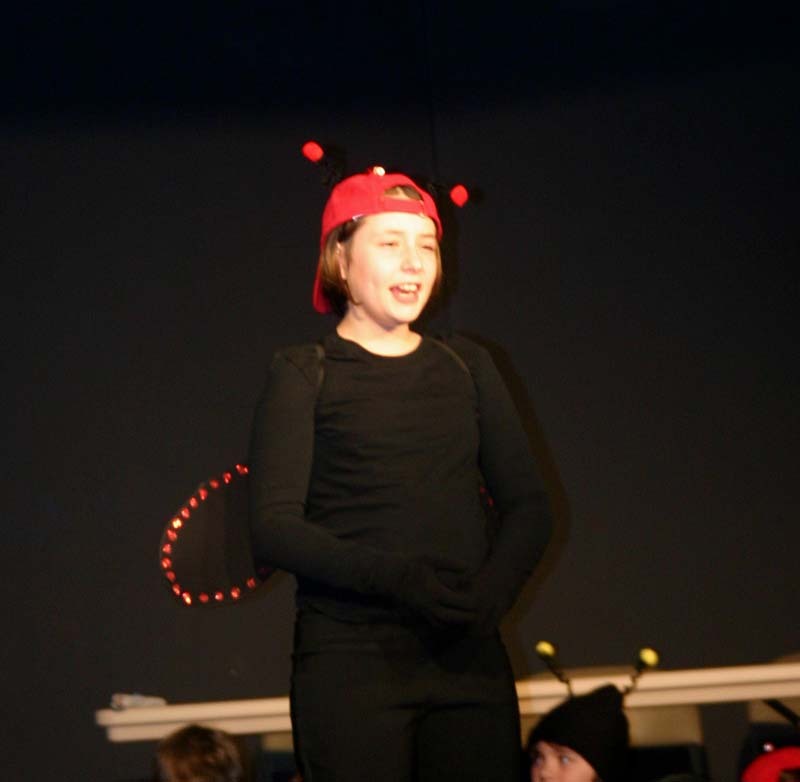 The program gave credit for the excellent costumes to Tina Drost for "her endless hours on costume planning and design." It was correct. The costumes and props were excellent. 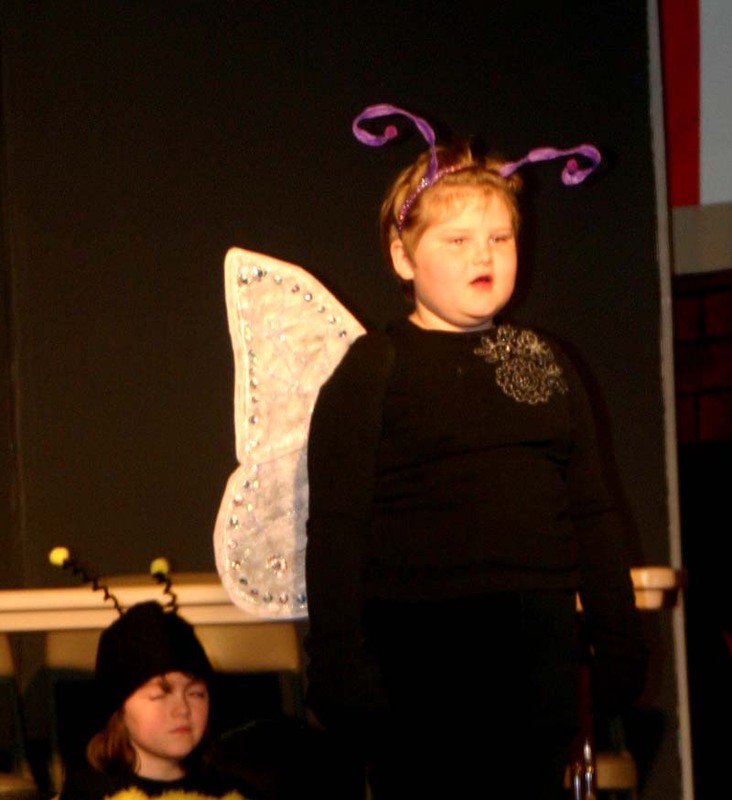 The cast list included Katie LaFreniere, Susi Myers-Dixon, Elsie Burton, Meg Works, Emily Burton, Jeffrey Rasch, Sharon Schwartzfisher, Truman Left, Kai Drost, Austyn Oliver, Lydia Gagnon, John Brady Robert, Hillary Rasch, Erin Myers-Dixon, Michael Myers, and Hannah Robert. 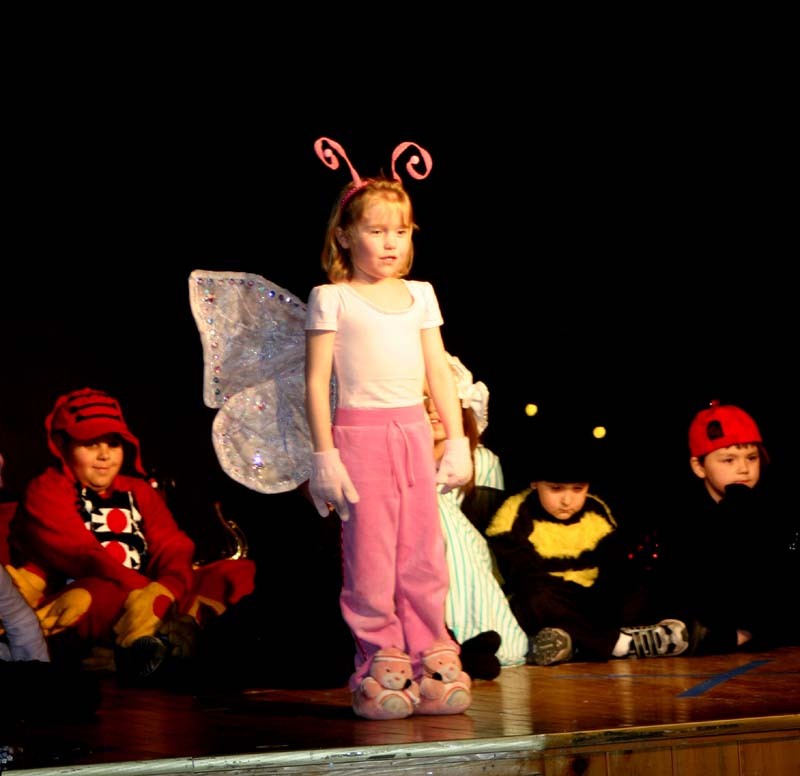 The Musical Sequence included songs "Goin' Buggy," "That's No Way to Treat a Ladybug," "Firefly, Firefly," "The Honeybee Song," "Fuzzy Little Caterpillar," "The Buggy Wuggy," "The Bugs Bill of Rights," and "Going Buggy (Reprise)."